We’d love your help. 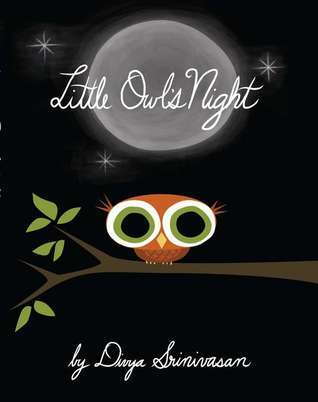 Let us know what’s wrong with this preview of Little Owl's Night by Divya Srinivasan. It's evening in the forest and Little Owl wakes up from his day-long sleep to watch his friends enjoying the night. Hedgehog sniffs for mushrooms, Skunk nibbles at berries, Frog croaks, and Cricket sings. A full moon rises and Little Owl can't understand why anyone would want to miss it. Could the daytime be nearly as wonderful? Mama Owl begins to describe it to him, but a It's evening in the forest and Little Owl wakes up from his day-long sleep to watch his friends enjoying the night. Hedgehog sniffs for mushrooms, Skunk nibbles at berries, Frog croaks, and Cricket sings. A full moon rises and Little Owl can't understand why anyone would want to miss it. Could the daytime be nearly as wonderful? Mama Owl begins to describe it to him, but as the sun comes up, Little Owl falls fast asleep. To ask other readers questions about Little Owl's Night, please sign up. Very cute! Lovely children's book. Little owl is having a wonderful night! There was a time that we used to read it every night before we slept. This book is beyond adorable! I'm a jaded old lady, and squealed a loud "Awwww!" at the ending. Lovely illustrations paired with a simple story about a young owl visiting a number of his friends over the course of a night. 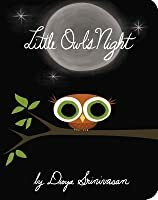 Adorable illustrations and some lovely poetic lines make up for the rather disjointed and somewhat rambling story of a little owl flying about enjoying the various sights and fellow creatures of the night. It's a good one to show little ones how night can be beautiful and un-scary. Owl out for the night. This is a cute story about a little owl who flies around at night, seeing other night creatures about their business, and generally just taking delight in his surroundings. I enjoyed it, and I hope it will help my nieces with their fear of the dark. As an avowed night owl myself, I really appreciated this rarity...a book that talks about the wonderfulness of the nighttime world, rather than just coming at evening from an "It's time to get ready for bed!" viewpoint. Nighttime is beautiful and magical for Little Owl, it's his world. I got it for my little son first, before we ever purchased the companion, Little Owl's Day, where our protagonist wakes up during the day, and like a child who wakes up in the night, decides to go exploring in an As an avowed night owl myself, I really appreciated this rarity...a book that talks about the wonderfulness of the nighttime world, rather than just coming at evening from an "It's time to get ready for bed!" viewpoint. Nighttime is beautiful and magical for Little Owl, it's his world. I got it for my little son first, before we ever purchased the companion, Little Owl's Day, where our protagonist wakes up during the day, and like a child who wakes up in the night, decides to go exploring in an odd world he doesn't know that well. Reading Little Owl's Night, first, was the right order, I think. Characters are introduced that come up in the other book, too - good old bear in Grumbly Cave! Very sweet story. My son and I enjoy reading it right before bed. A beautifully illustrated picture book with themes of nature and nocturnal forest life. A short and charming read. My son is obsessed with this book. He calls his favorite stuffed owl “Owl Night” and I have to read it at nap and bedtime every night. Love this book so much. My 1 year old's favorite book! Little Owl's Night is an adorable bed time story that young children, or if you're a child at heart and love owls, will fall in love with. It's simplistic story telling and vivid illustrations make it easy to follow, and enjoy. Though the story isn't an exploration like I thought it would be, it is one of those lovely children's picture books that leaves a smile on your face. Readers will love following the night's journey with Little Owl as he flies through the forest on his way to his tree and Little Owl's Night is an adorable bed time story that young children, or if you're a child at heart and love owls, will fall in love with. It's simplistic story telling and vivid illustrations make it easy to follow, and enjoy. Though the story isn't an exploration like I thought it would be, it is one of those lovely children's picture books that leaves a smile on your face. 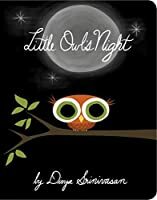 Readers will love following the night's journey with Little Owl as he flies through the forest on his way to his tree and mother, to get ready for bed. On his journey he sees his woodland friends, and takes in the night activities around him. One of my favorite things about the book besides Little Owl, was seeing all his woodland friends and what they were up to. Upon returning home, he asks his Mama about the fast approaching morning. I liked how Divya gives readers both the night life in the woods, and what transpires as the sun begins to rise. Baby owl is asleep before Mama Owl finishes her story and the sun is up, but readers get to see all the that happens as the woodland animals who are up all night head to bed and the morning animals awake. I loved everything about this book. The story was simple. The art was simple. Nothing was overdone, and it was very enjoyable. It told of nighttime in the forest, and how different animals act at night. I kinda wonder if the Bear will notice, after waking up, that the badger was stealing his fishies/food as he slept. Nothing was said about this in the story, but it was shown on 2 separate page-spreads. Mama Owl's story of how night turns into day is beautiful. I read I loved everything about this book. The story was simple. The art was simple. Nothing was overdone, and it was very enjoyable. It told of nighttime in the forest, and how different animals act at night. The art looks almost exactly like that in the Czech animated kids films about Mole that I've shown at story hours for years. Huge eyes,sharp angles, bold solid colors with minimal shadings. There's child appeal in the art but not much story--mostly just Little Owl observing other animals until he gets home and asks Mama about how night ends. He falls asleep over Mama's answer. The end. Cute, but not much more. I really liked the illustrations - Divya Srinivasan makes the night a beautiful place, especially to all of the creatures who spend most of their "daily" lives in the dark. Young readers will be surprised and delighted to discover just how much is going on outside the safety of their bedrooms while they are sleeping. 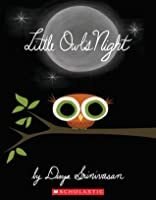 Absolutely adorable board book about Little Owl's nightly adventures and who he visits and sees on his adventure. 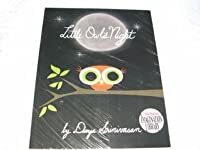 The illustrations make the book, with Little Owl's big eyes and the bats coming home in the morning as he listens to his mom's tale of how the night ends and the day begins. This is great for the little ones. The text is clear and simple and the art work is luminous and engaging. This is a great read aloud or quiet contemplative read alone. The contrast of bright earth tones against the dark "night" backgrounds is simply beautiful. Very simple text lines. Beautiful illustrations. Wide variety of animals. About a very small and adorable owl visiting with other animals and wondering what happens when night ends. Super cute good night book for children. Great book! Read for my son and he loves it. There are different animals and their activities at night. We like the pictures and short sentences. We bought this book because he says his school has the same book. A sweet little story about how night and morning comes about. Cute little picture book about what happens when it's dark. Would make a nice book to share during a bedtime or nature themed storytime. I like that this book features all the creepy night animals, like possums and snails and skunks. There is a picture of a sleeping bunny, but he's not mentioned. There are also dead fish. The activities of various nocturnal critters seen through the wonderfully exagerated eyes of an owl. A beautiful picutre book debut.